Merry Christmas and a Happy Prosperous New Year to you and your family, MM! Thanks for the tip, I have some friends who would be trooping to S & R for that speculators..
At Duty Free, we found the Ovo Maltine – the spreadable ovaltine with the crunch. 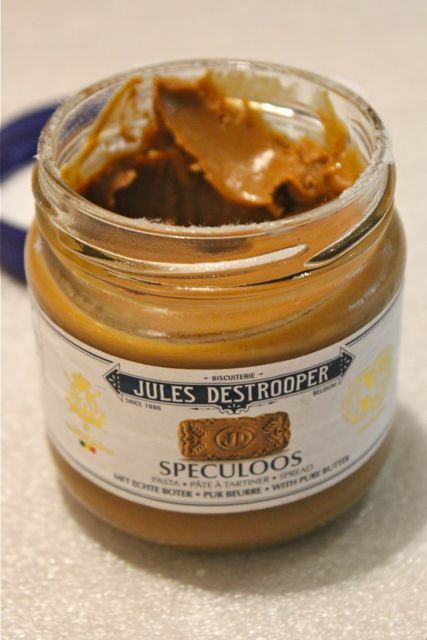 Speculoos spread is addictive. I like it when they’re on the spicy side, with a bit more cinnamon to it. Will have to check out that brand, as I only tried the brands my mom’s boss gave her. Spooned on the side of a good French vanilla ice cream is yummy. The original and most well-known brand is Lotus… this started when Delta Airlines started serving the Lotus biscuit which became very popular with travelers, after which Lotus started making speculoos followed by Trader Joe’s. It became so popular that TJ started limiting sale to one bottle per person/per visit. I think the limit is still going on until now, at least in NY/NJ. I wonder if it is similar to Biscoff which is a lotus brand and is made from biscoff cookies . You can have it creamy or crunchy. And they are really good. We have 3 bottles of Trader Joe’s speculoos cookie butter in our pantry and I haven’t figured out either how to use them. I tried it on suman and the combination is just ok. Suman and nutella is still better. – Mix with raisins, grated citrus peel and vanilla custard (not sauce!) and use as a filling in cinnamon buns/danish or fill into tartlets before baking. – The above mix sans grated peel, plus diced apples in an apple pie. Alternatively, layer the mix into the base of a tart and top with thinly sliced apples. Glaze after baking. – Mix with vanilla custard and ground almonds. Put a small dollop on egg washed puff pastry oblongs. Top with thinly sliced apples. Glaze after baking. – Mix with whipped cream and have it with pain perdu. Make ROTIBOY dough. For topping, sub the coffee topping with the cookie butter decreasing the amount of sugar and butter. say if instance, replace half the amount of the butter with the cookie butter. Then add the remaining topping ingredients. Then use piping bag to swirl it onto top rotiboy before baking. hey La Emp, Mrs. P and Cwid…besides your hands on ensaymada lesson when we have our kape-kape over at La Emp’s, we can make ROTIBOYS with assorted toppings, this cookie butter topping being one of them OR I will t each you how to make my granola, turn it into what I call Granola Buttercrunch cookie, then make Cookie butter out if it! then use that as palaman with the pan de sal CWID also would like to learn. Better make lots of chai tea La EmP!!! Hi ms. BettyQ!glad you are back. Rotiboy is the Singaporean coffee bun,right? Will you share your recipe? :) thanks and happy new year to you! ms. Betchay! My go to recipe is from House of Annie Blogspot. She is Malaysian and her rotiboy is really good! For the filling, you might want to mix in a dab of cookie butter with the cream cheese…not much so it is not over the top with the topping added on before baking. Another topping is mocha… Much like making mocha buttercream icing for Pinoy mocha cakes…mix together a few tsp. instant coffee ( i use Nescafe) and cocoa powder to total the amount of coffee in the topping. I was gifted a bottle and I didn’ t like it. Tasted like chewed cookie. I use Nutella for the filling, I’m pretty sure your Speculoos would be perfect! Betchay! My take on the rotiboy topping is to vary them. I like pineapple so when we have our kape-kape over here, I will do those various toppings. If you wnt to try them, same ingredients sans the coffee. Instead use evap milk flavoured with pineapple extract. Another one will be Irish Creme…if you don have Irish creme coffee creamer, use Bailey’s. Using Nutella as well with a touch of Frangelico will be good! This is just what is in the top of my head. I know I will come up with a few more flavours. Oh….my very favorite one is toffee. So use browned butter and light or dark brown sugar, a touch of vanilla. Oh Speculoos! In the Netherlands there are a lot of brands selling cookie butters, the more famous are Helema and Lotus, and they come in crunchy, creamy and chocolate versions. I dont like speculoos spreads much but the cookies are great! perfect for coffee breaks. Also there are speculaas spice mixes available which lend thrmselves well to all sorts of speculoos experiments – cookies, breads, ice creams etc! Because of your post MM I remembered I still have a pack of that spice mix. Time to make use of it!